Includes the charming American sharp shooter's two revolvers and holster as accessories. Entertainment Earth Convention Exclusive! Ethan Chandler, the brash American gunslinger, undergoes a powerful change when the moon is full. The meticulously detailed Penny Dreadful Ethan Werewolf 6-Inch Action Figure - Convention Exclusive from Bif Bang Pow! showcases the brash American gunslinger in his werewolf form wearing a short gray coat made of soft and bendable PVC plastic. The rest of Ethan Chandler’s outfit consists of a brown shirt with gold chain and dark gray pants. 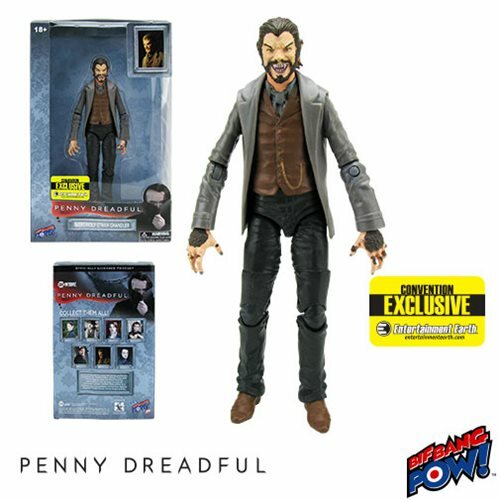 This first ever 6-inch figure of the popular Penny Dreadful character features an amazing 18 points of articulation. With a production run of only 2,400 pieces, this individually numbered and limited edition Entertainment Earth convention exclusive will disappear scary fast! Ages 18 and up.